Juan Montes is seen here working at Walters Inc. in Stoney Creek on a project for a mining company in Saskatchewan. Juan Esteban Moreno Montes has done it all. Landscaping, stonework, cleaning, farming, tiling, hospitality. You name it, Montes has done it. He couldn't imagine doing any of it for the rest of his life, but he didn't think he had that many options. After high school, Montes finished a semester at a liberal arts college, then dropped out. He took a job packing vinyl siding at Burlington's GenTek Building Products, but was laid off in 2012. That's when Montes, 21, found out about a joint program through Mohawk College and steel manufacturer, Walters, Inc. 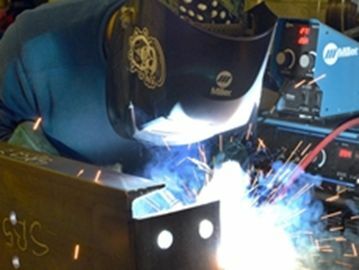 The Mechanical Techniques Welding and Fabrication certificate was launched at the Stoney Creek campus in January 2013. It's a kind of preapprenticeship that mixes hands-on classroom learning with one paid day a week working at Walters. Students (there are 12 in Montes' class) can earn six welding tickets and get on-the-job experience. Montes says it fosters a different mentality to be completing real work orders versus class projects. At Walters, he's currently welding parts of a mining headpiece for a site in Saskatchewan. When finished, it will be the largest of its kind in the world. "That's something we can't replicate in school," says Marla Robinson, associate dean at Mohawk's skilled trades campus. "The sheer size of what they're working on is something we can't even touch." According to Marty Verhey, HR manager at Walters, it's a mutually beneficial arrangement. He says there's a shortage of skilled tradespeople. Among those who do get into welding, their training is broad. It's hard to find employees who have focused on the kind of structural welding done at Walters. The partnership with Mohawk addresses both problems. Linda MacKay, manager of issues and media relations at the Ministry of Training, Colleges and Universities, says that Ontario Job Futures projected employment opportunities for Ontario welders and related machine operators to be average over the 2009 to 2013 period (the 2013-2017 outlooks are being updated for late 2013). Futures says new positions will depend on current welders retiring and continued activity in the construction, manufacturing, and oil and gas sectors. However, it also says that because welding skills are transferable to many industries, welders are less vulnerable to economic slumps. MacKay says the Mohawk/Walters program will help employer and potential employee. Companies like pre-apprenticeships because they better prepare students for entry-level positions; students like Montes benefit from the combination of theory and practice. "I have friends who are apprentices now and it took them two, three years to find an apprenticeship," Montes says. "Being started as an apprentice now is actually a huge advantage. I have friends who aren't in the program and they're like 'wow you guys are golden. You guys got the chance we never got.'" The Mechanical Techniques Welding and Fabrication certificate begins again in January 2014.